My bet is you have a busy week ahead. Maybe you're waiting to catch an airplane, to pick up a child from piano lessons or to let your nails dry...and you have just a few minutes to read something worth your while. I'm glad you stopped in here today because I have just a few encouraging words that could truly change your marriage this week. Maybe they won't fix everything, but they could iron out a dent, freshen the air or let out a little tension. Gals, here are just a few words you could say to your husband this week that might infuse a little life into your relationship. You don't have to write him a letter or give him a speech. Sometimes big changes can result from just four words...or three...or two...or even one! I believe it was the movie Love Story that taught us that "love is never having to say you're sorry." Well, that was false doctrine! Love says I'm sorry, but it also seeks true reconciliation, looks out for the heart of the other person, values the other's feelings and humbles itself. If you catch yourself saying the word "but" during your apology, watch out! You're wiggling out of it. Don't do that. Face the music and lay down your weapons. Don't just say, "I'm sorry," but clarify what you're apologizing for. Ask for forgiveness. When you ask the other person to forgive you, you're showing them that their response matters to you and that you value the relationship you share. Apologizing is hard, but I'm guessing we'll all have opportunities for practice this week. Probably most of us throw those three little words in at the end of a phone call or before we go to bed. But how wonderful is it when someone just surprises you with those words of endearment in the middle of dinner, in a moment of weakness, as you ride down the road or while you walk hand in hand? Take the time to intentionally show your husband love, especially in his love language (words of affirmation, acts of service, meaningful touch, gifts or quality time), along with those three powerful words, every day for a week. Obviously I'm not suggesting you address your husband as lord. Instead, these are two words you need to be saying on his behalf every day. No, not in exasperation either! In prayer. If you're struggling with how to pray for your husband, may I suggest a few things? Pray for him to feel God's presence and hear His voice. Pray for him to be obedient to God's leadership. Pray Ephesians 3:16-20 for him. Ask him how you can be praying for him. Our men crave respect every bit as much as we desire to be loved. We can show our husbands respect by listening to him, refraining from interrupting, affirming him when he serves his family well, showing appreciation for the contributions he makes and encouraging him to fulfill his dreams. Wow! That's a great idea. Wow! I hadn't thought of it that way. Wow! You got the garage so clean we could eat out here! Wow! You're looking good in those jeans! I'm not suggesting you patronize your husband with insincere compliments. And I don't know that you should preface every affirmation with the word "wow." But you might trying saying the "wow" in your head and then following through with honest and appreciative words that honor him. He could use some enthusiastic affirmation from the one he's chosen to spend his life with. 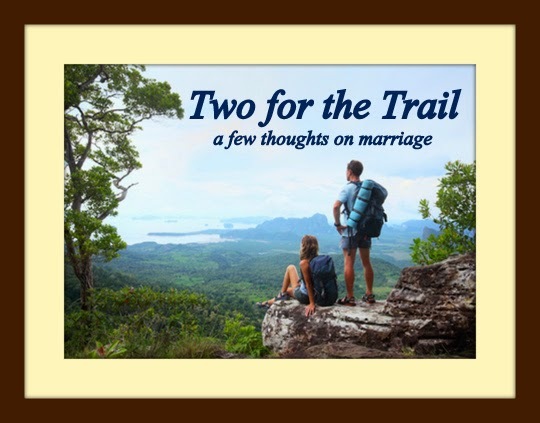 You may have some major overhauling to do on your marriage. Most of us find ourself in that place somewhere along the journey. But overhauls can seem overwhelming. Why not start with just a few words instead? Maybe one this week, two next, and so on. 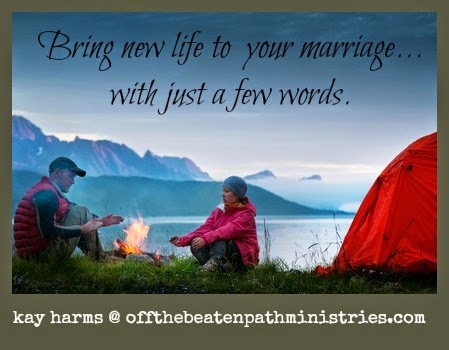 What words have infused life into your marriage? We'd love to know!